Before your new puppy or dog arrives, there are a few things you need to get ready to make sure they’re comfortable and happy in their new home. Choose heavy-bottomed ceramic or stainless steel food and water bowls. Plastic bowls will probably end up as chew toys, and the tooth marks could become a haven for bacteria and damage teeth and gums.. A heavy bowl will also be harder for your dog (and you) to knock over by accident. By law, all dogs must wear a tag on their collar showing their owner’s name and address. It’s a good idea to add your phone number too. You can order a tag over the internet or at your local pet shop. Because collars can slip off or break, we recommend microchipping: it’s quick, painless, permanent and effective. Ask your vet to insert the chip and you’ll have a much better chance of being reunited if your puppy or dog or dog goes missing. Check with the breeder or rescue home to find out if the puppy or dog has already been microchipped, and ask them how to register the chip to your address. Dogs love chewing and a teething puppy or dog will chew anything they can get their jaws around. So if you want to protect your socks, your shoes and your sofa, buy a selection of chews for your puppy or dog to test their teeth on instead. Just make sure they’re non-toxic, durable and not too tough for puppy or dog teeth. And never leave your puppy or dog alone with anything that could choke them, splinter in their mouth or electrocute them. There’s an amazing selection of dog toys out there – take a look in your local pet shop or go online: you’ll find safe rings, balls, slings, tugs and fabric frisbees. They’re all designed to make your play and training sessions more fun – for you and your dog. For your puppy or dog, grooming isn’t just about untangling their coat and making them look smart, it’s a bonding experience that reminds them of being back with their mother. Visit your pet shop to pick up a comb or a brush and plan daily grooming sessions. Different coats will need different brushes -- ask the pet shop staff, your puppy or dog’s breeder or other owners with dogs like yours for advice. You’ll also need to clip your dog’s nails and give them a bath from time to time – so it’s worth picking up a pair of nail clippers and some dog-friendly shampoo too. Stairs, balconies and ponds should all be out of bounds for an inquisitive puppy or dog – and a strategically placed baby stair gate will do the job when you’re not there to supervise. A gate can also help you protect your furniture and possessions from your puppy or dog’s unstoppable chewing instinct. You may have been given a travelling crate to bring your puppy or dog home in. And as long as the crate’s big enough for your puppy or dog to turn around in comfortably, it’s great for indoor use as well. Dogs hate to go to the toilet in their own bed, so a crate is a great toilet-training aid in those first few weeks when your puppy or dog is adjusting to their new routine. You can also use it to take them in the car to explore new sights and sounds. At night, put your puppy or dog to bed in their crate and, as long as you let them out at suitable intervals, they won’t urinate or defaecate on the floor. Arriving at their new home is going to be a big change for your dog. So one of the kindest things you can do is to give them a bowl of the same food that they’re used to. It’ll make your dog feel welcome and secure. After that, you can decide what food you’d like to give them. If you decide to change the dogs diet, ensure that you wean gradually over 5-7 days by mixing the new food in with the old. It is important to feed a complete and balanced dog food appropriate for the dogs age and life-style. At Pedigree, over 50 years of nutritional research have gone into ensuring our food contains exactly the right mix of protein, carbohydrates, vitamins and minerals, fats and fibre for each stage of your dog’s life. You won’t be able to take your new puppy or dog out for walks until they’ve had all the right jabs. You can spend this time getting them used to wearing their collar and a lead. That way, it won’t be an issue when it’s time to explore the outside world. Collars and leads come in a variety of materials. Nylon or soft leather adjustable collars are recommended, as they’ll grow with your puppy or dog. Adjust the buckle so that you can comfortably put a couple of fingers between the collar and your puppy or dog’s neck. Check the fit regularly; you’ll be amazed at how fast they grow. Ask neighbouring dog owners to recommend a vet, or use our vet finder tool to locate a local surgery. As soon as your dog’s used to you and their new home, take them for a visit. Besides a general check-up, you’ll need to talk about worming, vaccinations, microchipping and neutering. Take some treats along and make a big fuss of your dog. 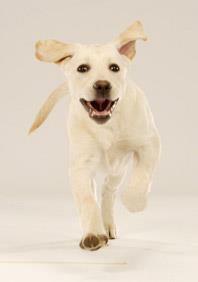 With the right vet practice and a positive attitude, a trip to the vet’s could be fun for your dog, rather than scary.